June NSIDC cliff is absent or in the wrong direction but the data where it shoots up is compromised by satellite tests, so I'm just treating it as absent rather than an upwards cliff in June cancelled by a downwards one in July. It's called forecast error in the Schroeder et al. 2014 paper. It's obtained by simulating the "predictions" that the model would have generated in previous years, using only data that were available at the moment of the "prediction". E.g. they simulate a prediction for September 2010 by using the regression equation over 1979-2009 and then feeding the May/June 2010 data into that equation. They repeat that procedure for every year from 1984 to 2013 and then calculate the standard deviation of the errors of the simulated "predictions", giving them 0.44M km2 in the paper. I guess the 0.5M km2 is obtained by including the last 4 years of data too (up to 2017) and perhaps rounding to the nearest multiple of 0.1M km2. Thanks. Definitely sticking with medium confidence then! This is based on the calculations discussed here. Updating those calculations to use the latest July data, the calculated values are slightly lower than when using the June data, but still within the same bin. My predictions for June didn't have any confidence levels, because I didn't get how it works. Can I still change them to 'low'? Just a coincidence. I did not copy him. This month, the level of confidence is medium. I'm treating None as Very Low, (in all cases, not just yours), which is the option that I put in for those that didn't get it. Its far too late to change. Almost too late for this month too, a little under 10 hours left from this post. Compilation should now be up to date. Among those that have entered for both months, there is a general trend to higher predictions, almost everyone being 1 or 2 bins higher in July than June but the confidence is very little changed, almost all sticking at medium. The July SIPN report shows a modest uptick, from 4.6 to 4.7, but almost all the movement is due to statistical methods where the change is pretty similar to the changes people made here. In June I picked out: Rob Dekker's SIPN entry as 4.5 - 5.0 M here, Nico Sun looks like 4.0 - 4.5 M but there are inconsistencies in the confidence measures he quotes, and it might be VL or H, Slater method 4.75 - 5.25 M, UCL model 4.0 - 4.5 L and the model of the Met Office 4.75 - 5.25 L.
For July I'd rate Rob Dekker at 5.0-5.5 H (borderline M), Nico Sun 4.25-4.75 M (same problem with interpreting the confidence measures as June), Slater method 4.75-5.25 M, UCL and Met Office did not made a new assessment for July. Random Weather I'd put as 4-4.5 H (also borderline M, there's an element of judgement in translating a model into an entry, so unless the poster makes that judgement in their post, I'm just treating it as commentary rather than an entry). Schroeder I'm putting at 5.0-5.5 M for June and 4.5-5.0 M for July, although that method ought to be have narrower confidence limits in July, and I went H in my own entry here on that basis, their SIPN entry did not change. The predictomat I rate at 4.5-5.0 M.
The Slater figure is for the NSIDC DAILY extent, n'est-ce-pas? Which is usually a bit higher than the JAXA daily extent? My incredibly crude use of 10 previous years average remaining melt produces a JAXA daily extent minimum of 4.59 million km2. Perhaps I should apply the same method to NSIDC daily data. Yes I will. The application of it on the link I quoted is a daily forecast for 50 days in advance. It can also be used for forecasts over other periods, (and is done so for SIPN), by those with access to the model details. For the August poll here, I look at what it has said 50 days in advance across September, and subject to a couple of reality checks, roughly average it. The average date for the JAXA minimum (last 10 years) is Sep 12th - 50 days from now. The Slater 50 day projection is likely to be very close to the minimum this year (unless the oddness of this year produces a very mild late summer and fall?) ? I'm taking a little bit of a different approach here to make my (August?) prediction. I looked at the JAXA minimum extent ranks the previous years placed in (see graph below) and from there took the average rank, which is 4.21 from 1990-2017. For 2018 to be placed at exactly this average rank of 4.21, the JAXA minimum extent would have to be 4'344'239km2. I think for the August round we should generally be able to state things with a higher level of confidence, as we're now only about 45 days from the minimum. And although the range of minima for the past ten years has been very large, it really doesn't look like this year will be on an extreme end of that range. August Polls have been up long enough to get a fair number of entries so even though they aren't stickied yet, I'm opening this Challenge for entries based on them. August 12th (BST) is the final day to post here. I expect there will be some upwards movement in confidence, though its quite a stretch to go from H to VH for me, that overconfidence penalty is really quite severe. I'm still happy with my picks from last month's polls though, so I'll be thinking about whether I can stretch on the NSIDC average as the deadline approaches. If a anything, the last few days have driven home to me just how volatile and unpredictable conditions are. Sticking with medium. Fair point if you're already going H. But personally, I think it's about time I went up from my L.
Fair point as well; but there's now less time left for that volatility to happen. This is why I like the Slater model. It gives me a method of assessing the implications of concentration changes now, for the extent in 50 days time. And at the moment its completely serene about them, ticking the amount of ice it expects to survive up slightly over the past week. i.e. ice that was going anyway is going anyway, but the places that are likely to be marginal in September are looking a teeny bit more solid. However, maybe next week those marginal places start getting eaten ... which is why I'm both happy with my July pick, and running down the clock before making the August one. I now guess the September minimums will be just above the current records, so (to enumerate the guesses) I choose the lowest bin that starts above the record low for each measure (extent, area, volume). I still say guesses should be recognized as having no confidence. As of yet unknowable weather, of course, will be a significant contributor to making or breaking every guess, prediction or sure thing declaration. The clock is ticking and its time I put my entry in. While 2 weeks ago I was happy with the bin I picked last month, Slater has shifted fairly dramatically compared to anomaly persistence during that time, my reading of Wipneus' home brew areas backs up that shift, and I'm going up a bin. VH or H that is the question. Breakeven expectation if only being 1 bin out is considered happens at a 75% chance of hitting the right bin. (i.e. at 80% correct, 10% 1 high, 10% 1 low, VH comes out ahead) While I am that confident on the high side, I'm not on the low side, so I'll have to stick at H.
And where's that predict-o-matic up to now, including confidence intervals? Found it! Mean is 4.23, 95% range is 3.70-4.77. Thanks Ned! My estimate is slightly higher than that, but not by enough to pick a higher bin. Reason being highish concentration & potential for dispersion. I don't know if my rationale is valid or not but accumulated cyclonic energy this hurricane season has been running quite high and all that heat and moisture eventually ends up polewards. I'd imagine that transfer of energy can only exacerbate a GAC like event late in the melt season. Expecting September to be very slow in its re-freezing because of all this energy. I’ll go for those same odds. This is slightly lower than my vote in the July polls, but higher than in the June polls. 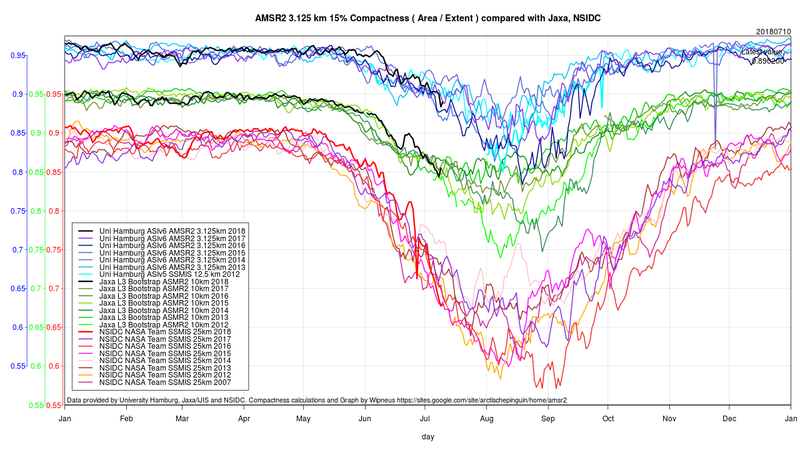 NSIDC extent is currently 6th lowest or so. Extent trajectories for previous years suggest about 4.6 million km2 for the NSIDC September extent. On the other hand, Slater's method seems to suggest about 4.9 million km2 for the NSIDC September extent. In both cases this is in the 4.5-5.0 bin. For JAXA extent I choose the 4.0-4.5 bin, which is two bins below NSIDC. The difference between JAXA minimum and NSIDC September extent was about 0.3 million km2 on average in the past 15 years. But in the past 6 years (since JAXA started to use AMSR2 data) it was always more than 0.3, and almost 0.4 million km2 on average. My NSIDC prediction has been very consistent! Last day for challenge entries. Deadline is about 11 hours from this post. Purely based on a climatic heli-view, based on good friend Jörg (Kachelmann)'s model input. And with Aug. 16th ECMWF HD predictions taking another pull at the NH, with Greenland and Svalbard meltwater getting warmer than ever, and SST anomalies of all oceanic surroundings at record high for August, thick new heat blankets of CH4 at surface level all over EurAsia. The energy has to go somewhere. Hopefully the jaxa data can come in here soon, so we can make some good guesses on what the minimum will be. I can see that NSIDC September average goes a little above 4.75M km2. It will depend of the freezing on Sep. 15th-30th. It's looking very likely JAXA will be in the 4.25-4.50 range, and NSIDC will be either side of 4.75. The rest of us are still waiting for NSIDC to make its mind up, but Neven can be scored now. I picked all the same bins as him except for June NSIDC (I picked 4.25-4.75). So I got at least 5/6 right. And I had higher confidence levels in June & for August JAXA. I got 7 points for Jaxa (1 point for missing by 1 bin in June on Low, 2 points for a hit in July on Low and 4 points for a hit in August on Medium). As expected, going for Low confidence dragged down the scores, but it felt like the most honest description, especially in June. Probably 7 or 8 for NSIDC, making it probably 14 or 15 points. August predictions editted into the top post, if I missed any, let me know. One titbit from August SIPN: Slater model went for 4.75 which might well be taken as 4.5-5.0 VH, though there's not really enough information given on the uncertainty to be sure it should be VH rather than H.
I'll tot up the scores once the NSIDC September report is out. Most regular competitors either hit the bull's eye or missed by at most one bin on all entries. Almost every use of VH was overconfident and took the -10 penalty, although plenty of entrants would have got lucky if they had used it, but it would have turned out badly for me if I had gone VH when I was thinking about it. Interesting that NSIDC was exactly one bin above JAXA - 0.25. So both were just 0.04 below the bin boundary. 20 Neven - average confidence of Low-Medium (partly by accident), maximum bin accuracy. Daniel B. and Stephan both did very well in June (10 points, called NSIDC dead accurately with High Confidence), but then didn't come back to this thread in July or August. I would have stayed with my bets throughout the summer and therefore I didn't repeat them. Should I have done so? If you had made the same entry in July and in August, you would have won! OK. As a newbie here in this forum and as a non climate scientist I feel honoured. If there will be a comparable thread in 2019 I will not forget to repeat my June predictions in July and August! We could do that, although we never had a December (June-equivalent) poll this freezing season. Feel free to post your predictions for the maximum. I think I'd go 13.875-14.125 High. I actually voted in the 13.75-14.0 bin, but I was torn between the two and think the risk is mainly upside. Looking at last year, the top two for their June predictions were Daniel B. and Stephan, with ten points each. Congrats to both. Trying to get out of the habit of excessively low confidence that I demonstrated in the melting season. It's always possible to be wrong of course, but the numbers in this game absolutely favour going for High confidence whether you're sure or not. Now I'm wishing I had adjusted this up to 14.125 - 14.375 like I did in the main max poll. 2 points Paddy, 2 points Brigantine, -2 points Richard?